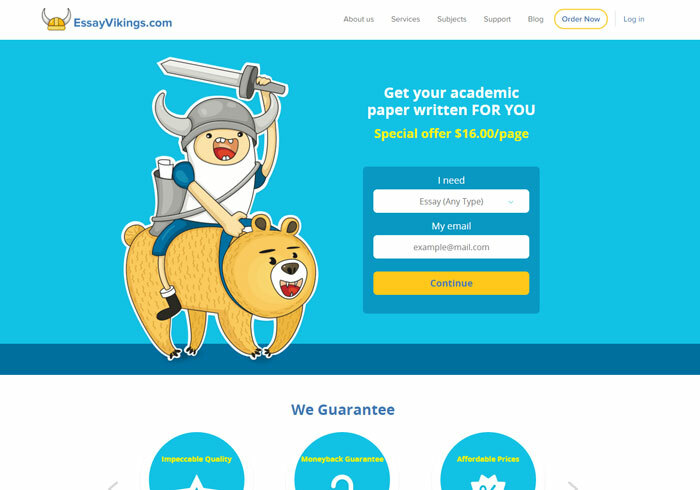 Here we are offering a review for those students who are thinking whether to try EssayVikings.Com or not. A clear analysis that takes into account all the points will be carried out. From the home page, we have got ready to lies because the statistics shown on it never changes. The first thing that caught our attention was that the service has a special offer – $16 per page! However, those who have already tried similar services, already know that this does not sound as a good deal. When other services offer $10 per page, $16 per page sounds ironical. However, let us see, what you get paying those $16. There are three types of quality rates. As $16 is the minimum, this is the payment for the Standard quality. For you to know, there are also Premium and Platinum qualities, meaning that the standard quality paper has a lot of things which can be improved. Why have we mentioned those $16 so often? The thing is that the service does not have the pricing list. You learn your price only after placing your order, and this sounds like a trap. The only extra feature offered is the possibility for you not to select your writer. You can pay $9.99 without knowing who will write your paper, and this does not sound attractive at all. The good thing is that the not only does service write from scratch but it can also correct your paper. However, the quality of such correction is another question. To learn more about the services offered by this company, we have opened the list of services, but there we found just random texts filled with a lot of keywords for SEO optimization and nothing useful and informative. On the Terms and Conditions page we have read that there is a possibility for revisions, but this is actually all that is said about them. So, no one knows when you can ask for revisions. The deadlines for requests and the limits of the number of such requests remain unknown. There is also the lack of information on refunds. The only thing one can see is that a refund request is not accepted if it is sent after more than 3 days. Some projects may take weeks to be reviewed by a professor. Also, you may need more time to review the delivered work if it has more than 8 pages and you are quite busy. Thus, if you pay to essayvikings.com, you may forget about the money paid, as you will not get them back even if the writer completes an irrelevant work. To make our review full, we have placed an order with essayvikings.com. We needed a Biology lab report completed within 1 day, and it was supposed to take 3 pages. We decided to select Standard quality to see what is considered to be standard for this service. We got the paper minutes before the deadline, and the quality of writing was poor, making us fully convinced that the paper was written by an ESL writer. Basing on the outcome and review of the company’s website, we can give it 5 out of 10, so we would not recommend it.